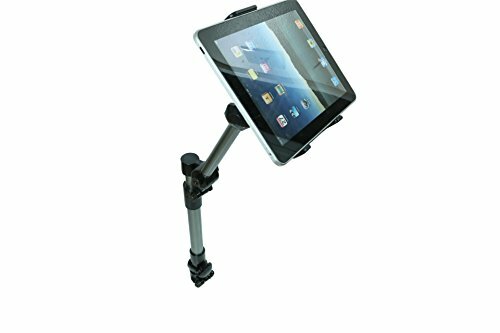 Mobotron UTSM-02 Tablet/Smartphone Mount is a high-quality, heavy-duty in-car device mount that is ready to turn your car/truck into a mobile office or entertaining studio. The Pole is made of Ø 30mm thick aluminum with smooth surface finishing and the telescoping section at lower pole allows adjusting from 19"~28"(483mm~711mm). The patented mounting solution provides easy installation and removal without drilling hole or damaging the floor of vehicle. Our universal device holder fits wide range of devices - from 4" smartphones to 12.9" tablets. The ball-clamping, teeth locking joints and pole telescoping mechanism all together maximize the flexibility and adjustability for best viewing position of the device.  Perfectly secure wide range of devices - From 4" smartphones to 12.9" tablets.  Patented seat rail universal mounting solution, 20 minutes easy installation, no drilling required.  Heavy-duty telescoping aluminum pole with high-end smooth Titanium-anodized finish.  Can be folded away or removed in seconds when not in use.  Ergonomic design that consists of 2 teeth-locking joints and 1 ball-clamp for best viewing & positioning adjustment. If you have any questions about this product by Mobotron, contact us by completing and submitting the form below. If you are looking for a specif part number, please include it with your message. Car Headrest Tablets Mount iPad Holder - FITFORT Flexible Back Seat Bracket Compatible iPad Mini 2 3 4,iPad Pro, iPad Air,Galaxy Tab,Kindle Fire HD,iPhone X 8 7 Plus,Smartphones 4"-10.1"